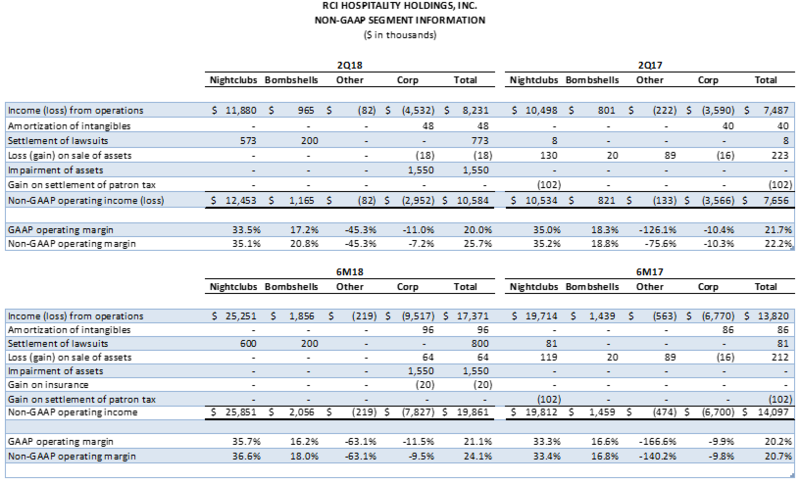 HOUSTON – May 10, 2018 – RCI Hospitality Holdings, Inc. (Nasdaq: RICK) today announced strong 2Q18 results along with the filing of its 10-Q for the Fiscal 2018 second quarter ended March 31, 2018. "We are pleased to announce another quarter of solid growth, reflecting the effectiveness of our strategies," said Mr. Langan. "Total revenues grew 19.4% year over year with increases of 15.7% from new units and 4.8% in same-store sales. Non-GAAP operating income rose 38.2% as margin expanded 350 basis points. "Revenues and margins benefited from our improved portfolio of nightclubs and restaurants, expanded operating leverage from higher sales, and increased customer counts. Nightclubs also benefited from higher spend per customer, while Bombshells benefited from an updated menu featuring new items. "Corporate overhead costs fell as a percentage of revenues compared to 1Q18 and 2Q17. On a sequential quarter basis, the decline was due in part to reduced expenses associated with our FY17 audit and the transition to a new financial IT system. Income taxes dropped, reflecting the Tax Cuts and Jobs Act. "As a result, non-GAAP EPS increased 58.5% to $0.65, and free cash flow grew 8.8% to $5.3 million for the quarter and 28.4% to $12.8 million year-to-date, keeping us firmly on track with our $23 million FY18 FCF target. "On April 11th, we opened our sixth and largest Bombshells in the fast-growing southern Houston suburb of Pearland. Performance has been excellent. For the first three weeks, sales have averaged more than $160,000 per week, making it our most successful Bombshells launch to date. "We now have four new locations in various stages of development in Greater Houston. That will bring the total of Bombshells to 10—eight in the Houston area and one each in Dallas and Austin. Using our established team of architects, contractors, and vendors, our goal is to open units on a regular schedule. "We are also pleased to announce that we are in active discussions with multiple club owners to acquire units in key markets and that positive trends for RCI clubs and restaurants have continued in 3Q18. "Looking ahead, we will continue to pursue our four-part strategy for generating increased FCF through (1) our strong core business, (2) roll out of our proven Bombshells concept, (3) the potential upside of accretive nightclub acquisitions, and, as always, (4) sticking to our capital allocation strategy." Total revenues increased $6.7 million, or 19.4%, as all core revenue lines continued to grow. Beverage revenues rose $3.1 million (22.0%), higher margin service revenues $2.0 million (13.9%), and food $1.1 million (24.6%). The third full quarter of Scarlett's Cabaret Miami and Scarlett's Cabaret St. Louis, both acquired in 3Q17, and the second full quarter of our Bombshells on Highway 290 in Houston, which opened 4Q17, together added $5.4 million in new revenues. Total and same-store sales also benefited from strong marketing related to televised pro football and basketball (pro and college) sporting events. In particular, our Bombshells sports bars/restaurants enjoyed increased traffic due to the continued success of the Houston Rockets and major college basketball tournaments. Operating income increased 9.9% to $8.2 million (20.0% of revenues) from $7.5 million (21.7% of revenues). LRCI wrote down $1.6 million of its note receivable relating to the energy drink venture and took advantage of opportunities to settle two outstanding lawsuits for a combined $0.8 million. 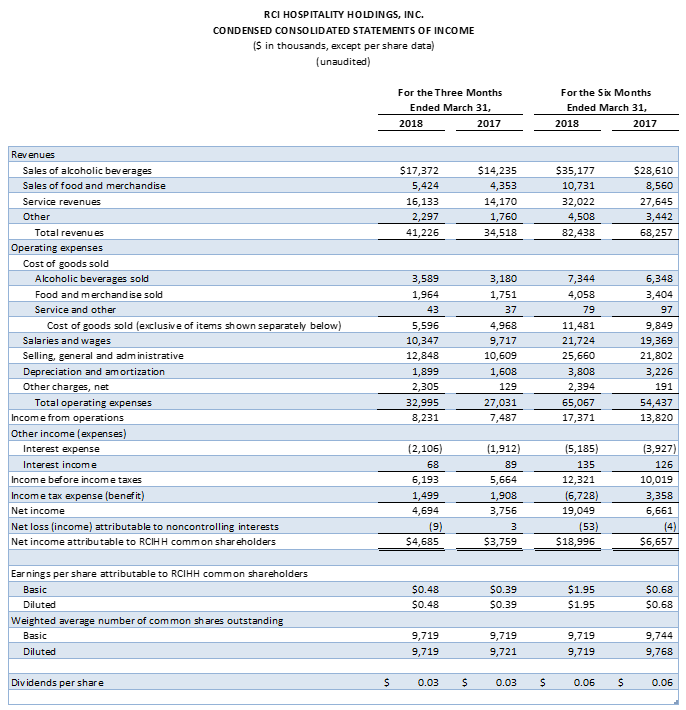 On a non-GAAP basis, operating income increased 38.2% to $10.6 million (25.7% of revenues) from $7.7 million (22.2% of revenues), reflecting increased contribution from the Nightclubs and Bombshells segments, including higher gross profit margin, and a reduction in corporate overhead. As a percentage of revenues, gross profit margin increased 80 basis points to 86.4% and non-GAAP corporate overhead declined to 7.2% from 11.8% in the preceding 1Q18 and 10.3% in the year ago 2Q17. Sales increased 18.3% to $35.4 million from $30.0 million, with 38 units compared to 37. Operating income increased 13.2% to $11.9 million (33.5% of segment revenues) from $10.5 million (35.0% of segment revenues). On a non-GAAP basis, operating income increased 18.2% to $12.5 million (35.1% of segment revenues) from $10.5 million (35.2% of segment revenues). Sales increased 28.0% to $5.6 million from $4.4 million, with 5 units compared to 4, reflecting the previously-mentioned addition of a larger Bombshells on busy Highway 290 in Houston. Same-store sales increased 2.7% as customers continue to be attracted to our military themed social dining concept with our Bombshells Girls, where you can have a great time and great food, watch the game, listen to music and hang out with friends or family. Operating income increased 20.5% to $0.965 million (17.2% of segment revenues) compared to $0.801 million (18.3% of segment revenues). On a non-GAAP basis, operating income increased 41.9% to $1.2 million (20.8% of segment revenues) from $0.821 million (18.8% of segment revenues). Cash and cash equivalents increased 4.6% to $12.5 million at March 31, 2018 from December 31, 2017. Occupancy costs (rent and interest expense as a percentage of total revenues) fell to 7.4% from 7.7% in both 1Q18 and 2Q17. Adjusted EBITDA increased 34.7% to $12.4 million—the highest in the last two years—from $9.3 million. Effective tax rate was 24.2% compared to 33.7% in 2Q17. 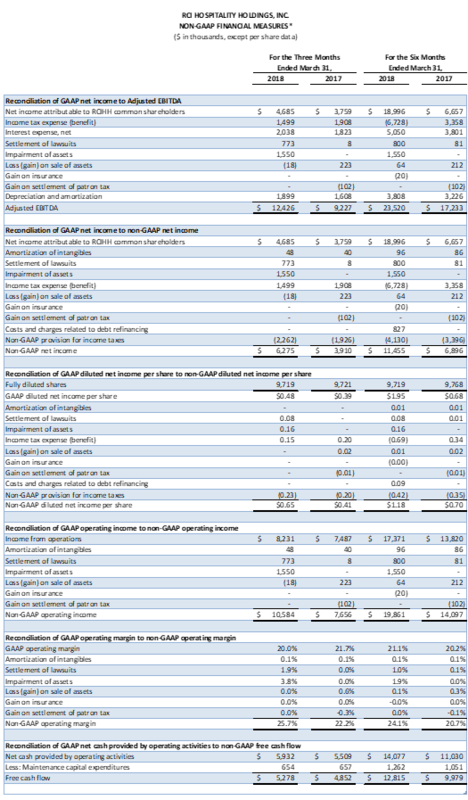 >Non-GAAP Operating Income and Non-GAAP Operating Margin. We exclude from non-GAAP operating income and non-GAAP operating margin amortization of intangibles, impairment of assets, gains or losses on sale of assets, gain on insurance, and settlement of lawsuits. We believe that excluding these items assists investors in evaluating period-over-period changes in our operating income and operating margin without the impact of items that are not a result of our day-to-day business and operations. Non-GAAP Net Income and Non-GAAP Net Income per Diluted Share. We exclude from non-GAAP net income and non-GAAP net income per diluted share amortization of intangibles, impairment of assets, costs and charges related to debt refinancing, income tax expense (benefit), gains or losses on sale of assets, gain on insurance, and settlement of lawsuits, and include the non-GAAP provision for current and deferred income taxes, calculated at 26.5% and 33% effective tax rate of the pre-tax non-GAAP income before taxes for the three and six months ended March 31, 2018 and 2017, respectively, because we believe that excluding and including such items help management and investors better understand our operating activities. Adjusted EBITDA. We exclude from adjusted EBITDA depreciation expense, amortization of intangibles, income tax expense (benefit), net interest expense, impairment of assets, gains or losses on sale of assets, gain on insurance, and settlement of lawsuits because we believe that adjusting for such items helps management and investors better understand operating activities. Adjusted EBITDA provides a core operational performance measurement that compares results without the need to adjust for federal, state and local taxes which have considerable variation between domestic jurisdictions. The results are, therefore, without consideration of financing alternatives of capital employed. We use adjusted EBITDA as one guideline to assess our unleveraged performance return on our investments. Adjusted EBITDA is also the target benchmark for our acquisitions of nightclubs.